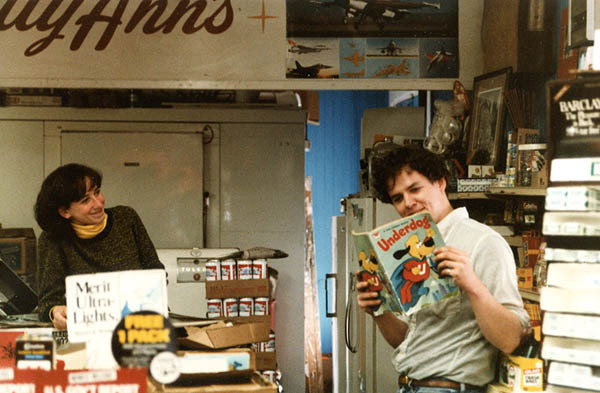 The Corner in its heyday: Patty Ann’s Superette, summer 1980. Scan from black & white negative/Hubley Archives. See photo galleries featuring pictures of Corner scenes and people, and more images from the May 1981 Fashion Jungle publicity shoot. Click on an image to enlarge (in slideshow mode, click to go to next image). The Corner is more than just the parking lot of a small South Portlandish variety store . . . Maybe you yourself have stood in the neon and watched the cars arrive and depart. Maybe you have launched an aircraft or an escape attempt. Maybe you have shown up, desperate for some laughs, and found no one there. For ten years now many legendary (many? five? six?) rock bands have emerged from the ferment at the Corner. You can see three of them . . . 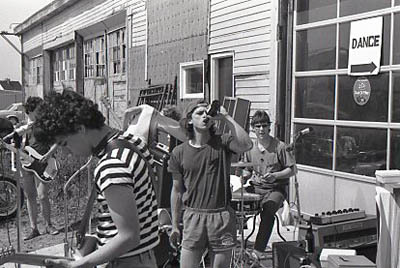 Corner Night was a tough concept to market: A concert by bands that all had roots in a social scene based at a corner store in South Portland. For those in the know, it felt deeply meaningful; or felt like it would be, if you could figure out what it meant. For those on the outside, well, Corner Night needed a lot of explanation. 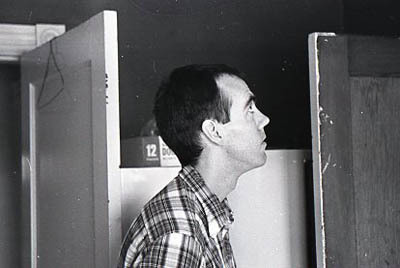 Jeff Stanton in the Stanton family quarters upstairs from the store on Ocean Street, 1980. Image scanned from black & white negative/Hubley Archives. 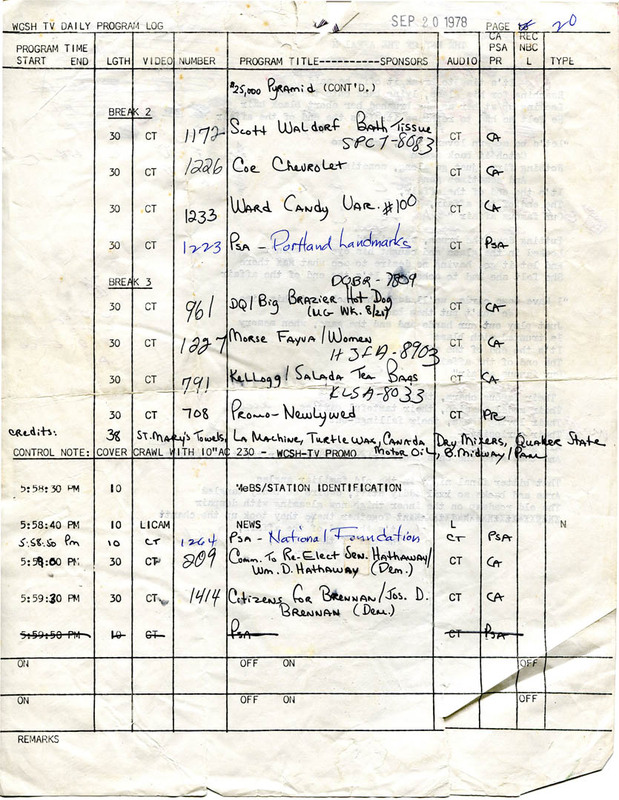 Do you know Peter Frame, the British music journalist who in the 1970s made “family trees” depicting the histories and personnel changes of rock bands? (One based on the Byrds and Buffalo Springfield hung on my wall for a long time, back before they were expensive collector’s items.) Something like that would help clarify the tangled history of the Corner scene, musically and otherwise. But, lacking the time and the facts to do a Frame-style tree, I can only tell you what I know. It seems like a lot, but is really only a narrow view through one of the many windows into Patty Ann’s Superette. The Pathetix are featured in this poster for the 1980 Corner Night. 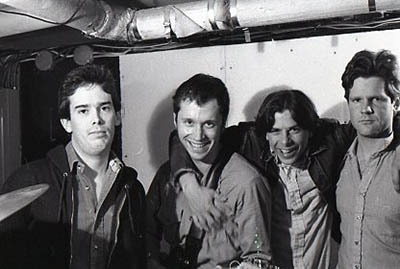 At left, Gary Piscopo and Chuckie Frederick are the Pathetix who were with the band from first to last. I think, but am not sure, that the other guys are Rick Hendrickson and Terry McElroy. Hubley Archives. Hanging around in the basement of the store, we were busy little teens, listening to Poco and the Blues Project, wearing bell bottom jeans, burning incense, etc. We hung around and talked, got snacks from the store, even tried our hand at launching a magazine (Gutroot— two issues, cranked out on a mimeograph at Craig’s house). But ultimately, as so often happens, there coalesced a band. 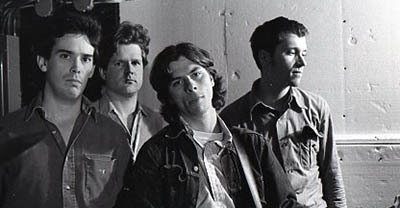 Truck Farm comprised Rolfe on rhythm guitar, me on lead guitar and most of the vocals, Hansen on drums, and a bassist named Ted Angel, whom I taught to play and supplied with my Hagstrom. 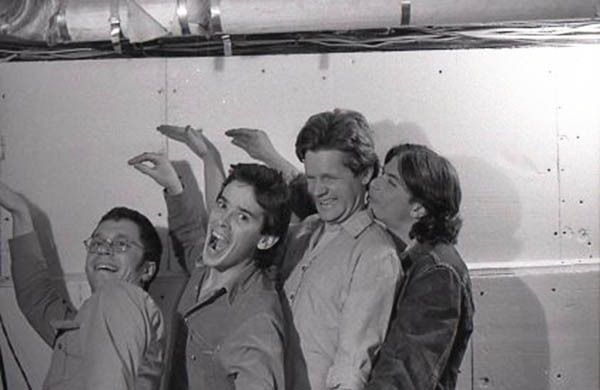 For Tom and me, having a band was the realization of a three-year fantasy. And, typically enough, the fantasy couldn’t stand the strain. 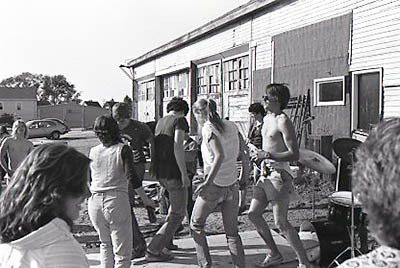 Following a highly exciting string of weekly performances at the Cape Elizabeth Youth Center in summer and fall 1971, the Farm fell apart — but Rolfe and I continued to play together for the next three years, in bands like Lama (don’t ask), Airmobile and the Thunderbirds. 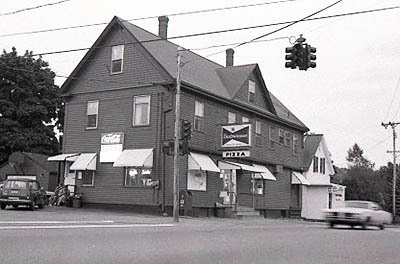 Music aside, the Corner remained a focus of my social life pretty much until the Stantons sold the store, in 1983. On summer evenings in the 1970s, after my shifts in the stock room at Jordan Marsh, I would bike to the store carrying the Silvertone 6-string; buy a Coke, pour half of it out and refill with bourbon; and sit on the bench by the mailbox singing country music. 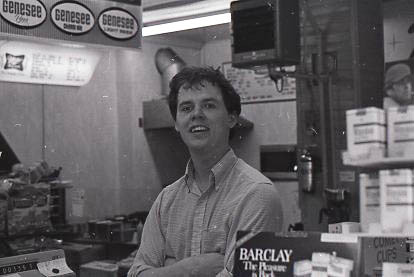 Phil Stanton working the food counter at Patty Ann’s, 1980. Scanned from a black & white negative/Hubley Archives. The eldest Stanton sibling, Jeff, remains one of my closest friends, and I was buddies with Phil Stanton as well as Scott. Among other things, we killed many hours making Super 8 movies and building U-control model airplanes through the 1970s. Jeff used to borrow the family Dodge van to drive our equipment back in the big-amps-and-drums days, and still attends nearly every Day for Night performance. 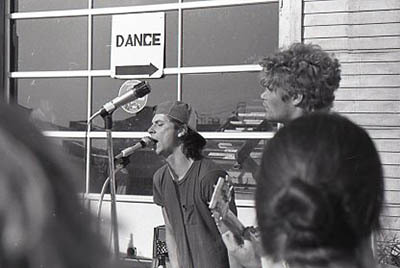 Mike performs with the Pathetix during a dance party in Ferry Village, South Portland, 1981. Image scanned from black & white negative/Hubley Archives. Among that Corner population were Mike Piscopo and his brother Gary. Don’t ask me how — I guess it was just what happened at the Corner — but by early 1977, Mike and I, a more peripheral Corner guy called Andrew Ingalls, and my Jordan Marsh co-worker Ken Reynolds were playing together as the Curley Howard Band. 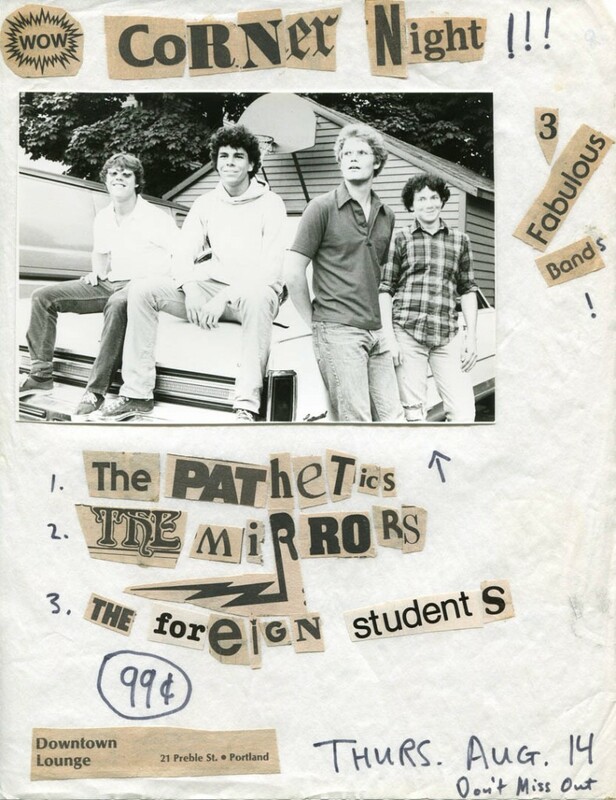 This, as you know if you follow this blog, led directly to the Mirrors, which played at the Downtown Lounge at the first Corner Night, in 1980, and to the Fashion Jungle, whose debut public performance took place the following year at the second Corner Night, at a place called Rock ‘n’ Roll Flavor. Where the Mirrors, as previously noted, were both headliners and flatliners at the first Corner Night, we opened the show and shut out the competition the following year. 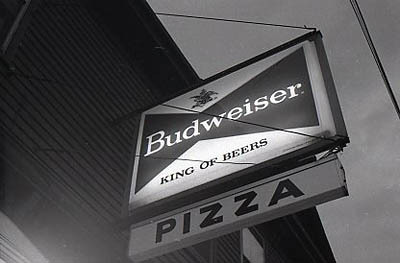 That was a close-run thing: The manager of Rock ‘n’ Roll Flavor picked the day of Corner Night to disappear, and it took some telephone persuasion to get the building owner to agree to the show’s going on. Filling out the bill at both Corner Nights were the Pathetix, consisting of Gary Piscopo and other denizens of the Corner; and the Foreign Students, led by John Rolfe and including his wife-to-be, Audrey Michaud; drummer Mike Alfiero, who continues to play with John (and with later-Fashion Jungle bassist Steve Chapman) in the Luxembourgs; and bassist Joe Marsh, brother of Ken’s and my Jordan Marsh stockroom colleague John Marsh. The FJ looking soulful in a 1981 publicity image. From left, Ken Reynolds, Jim Sullivan, Mike Piscopo, DH. Scanned from a black and white negative/Hubley Archives. Pretty incestuous. So I guess the point of all this, so far, is that in a small city like South Portland, “everyone knows everyone, for miles and miles around” (Ray Pennington and Roy Marcum, “Don’t Cheat in Our Hometown”). The bonds of acquaintance extended in all directions and, to really abuse the metaphor, wove a net that you could get a pretty good bounce off of. But every metaphor has its limits, every dog has its day, all good things etc., and the warm relations at the Corner, or in the friendly Greater Portland community in general, weren’t enough to keep everybody around indefinitely. 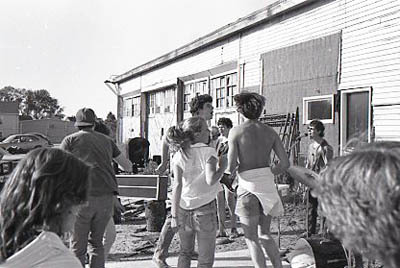 The summer of 1981, as previously noted, was glorious — and then it was over. It ended with a thud when Mike Piscopo announced his intention to move to Texas in the fall with his fiancee, Joy Pearson. And the next blow didn’t fall far behind as Jim Sullivan, who like Piscopo was fed up with crap jobs*, followed his fellow multi-instrumentalist to the exit, heading for Boston. 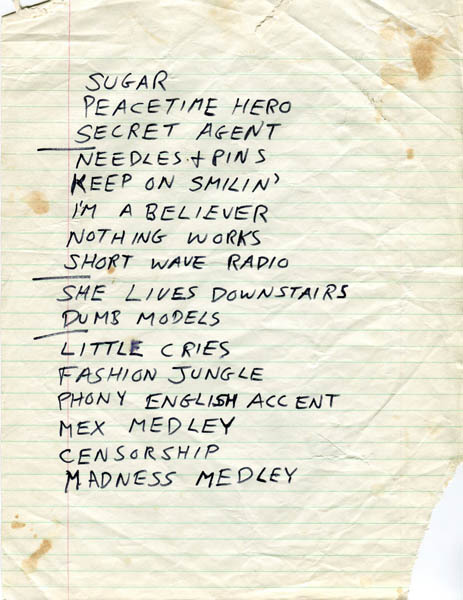 Fashion Jungle set list, Corner Night 1981. Hubley Archives. We performed three more times after Corner Night. We played in September and October at Kayo’s, a bar on Middle Street that was the successor, in terms of taste and talent, to the Downtown Lounge (in the audience for our second night there was Gretchen Schaefer, now my wife and bandmate). And we closed the book on the original FJ at the October wedding of — wait for it — yet another member of the Corner crowd. We learned “Daddy’s Little Girl,” “Moonlight Bay,” “Everything Is Beautiful” (which sparked up a great conga line there in the Black Point Inn) and similar schmaltz at the request of the wedding party — an ignominious end to a band founded in the rejection of blanditude. I was desolated. 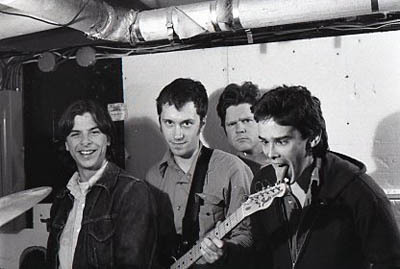 I couldn’t believe that Mike and Jim would just walk away from such a great band — but then, I never really found out what they thought about it all, either. And anyway, the FJ wasn’t done with Ken and I yet. 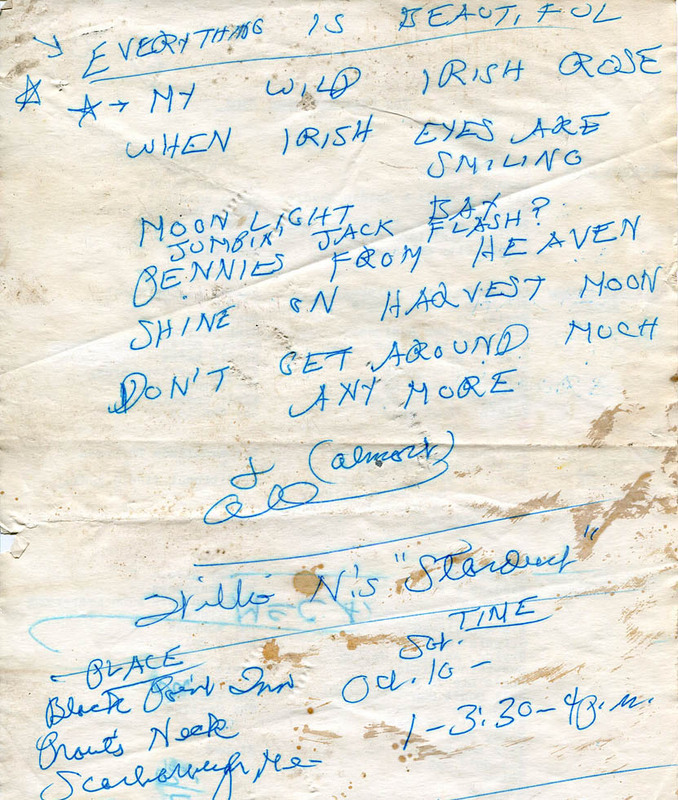 *Jim Sullivan updates the record in April 2017. And now for some music. 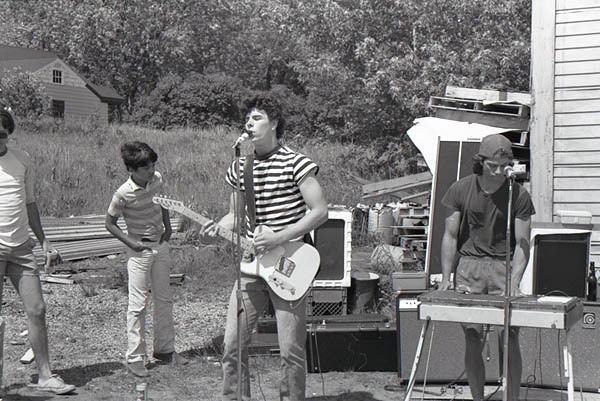 The original Fashion Jungle in its first public performance — the second Corner Night, August 1981, on a bill with the Pathetix and the Foreign Students at Rock ‘n’ Roll Flavor, Portland, Maine. Apologies for the ugly sound: This recording came straight off the PA, hence the distortion and dominance of the vocals. Setting aside the poor quality of the recording, it’s pretty hot stuff. Credits: Doug Hubley, lead guitars and vocals. Mike Piscopo and Jim Sullivan, see individual songs. Ken Reynolds, drums. 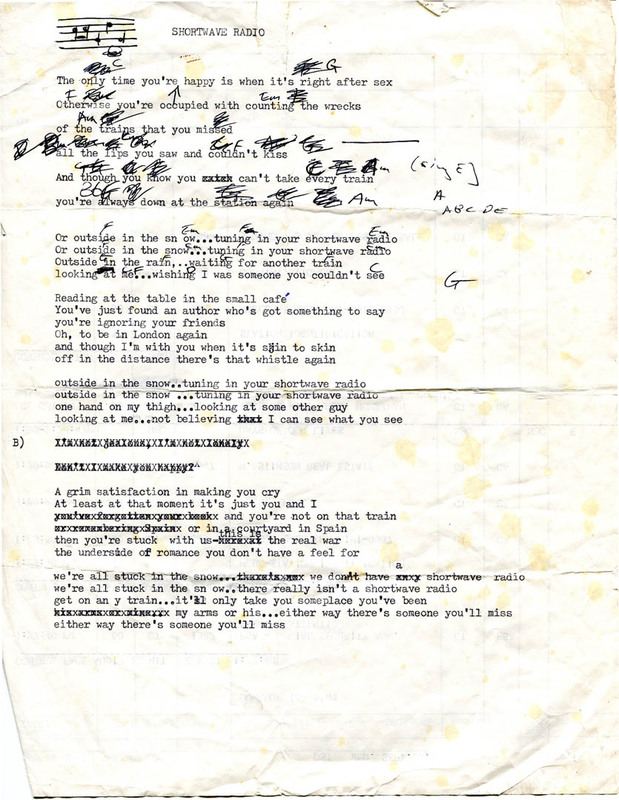 Little Cries (Hubley) Vitriolic lyrics about bedroom dishonesty set to an insanely complicated chord progression. The first song I wrote for the FJ. MP, bass. JS, sax. 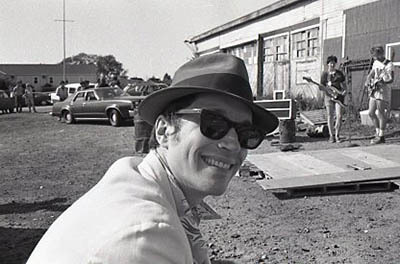 Peacetime Hero (Sullivan) Jim’s distinctive contributions to the FJ catalog were sophisticated musical structures and politically attuned lyrics. Here he puts himself into the mind of a killer who can find no other way to have a place in society. For years after Jim’s departure, this remained in the FJ repertoire. JS, rhythm guitar, vocal; MP, bass. Dumb Models (Reynolds-Hubley-Piscopo-Sullivan) A short-lived Fashion Jungle rule was that everyone had to bring in at least a fragment of original music each week. Here’s a result of that discipline: the lyrics are by KR, edited by me; the opening guitar riff was Piscopo’s; and we collectively put the whole thing together. MP, rhythm guitar, backing vocal; JS, bass, backing vocal. Shortwave Radio (Hubley) This stayed in the repertoire for more than 20 years, from the FJ through the Howling Turbines. MP, bass; JS, organ. Keep on Smiling (Hubley) The push for original material was so insistent that I revived this song created in 1973, when I was mad at one of my friends. These lyrics are melodramatic but the overall sense of angst still works. The big anthemic ending turned into something of an FJ characteristic. MP, backing vocal, bass. JS, backing vocal, organ. She Lives Downstairs (Reynolds-Hubley-Piscopo-Sullivan) Like “Dumb Models,” this was a product of the short-lived “song-per-week” phase when everyone tried to bring in at least a musical fragment that we could work with. This is based around a typically earnest KR lyric. Note the nods to “Gloria” and “Gimme Some Loving.” MP, backing vocal, rhythm guitar. JS, backing vocal, bass. 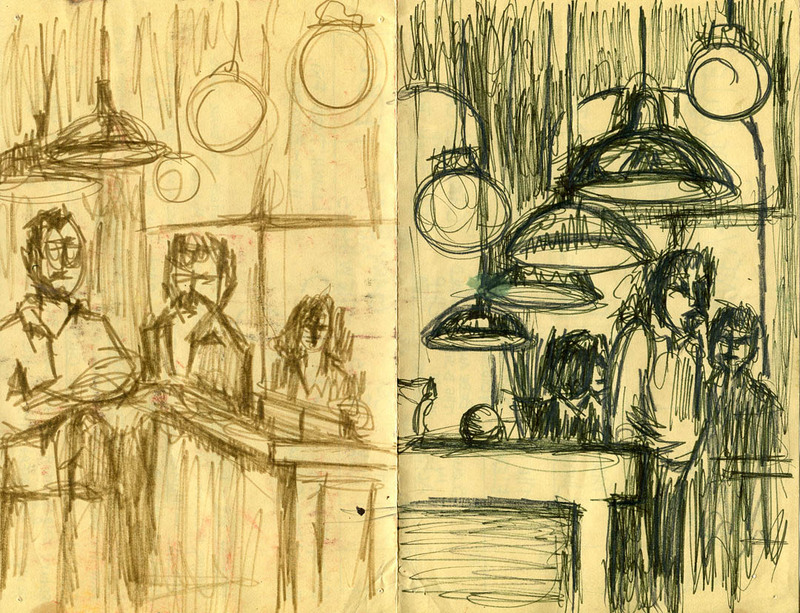 “Shortwave Radio” and “Little Cries” copyright © 1981 by Douglas L. Hubley. “Peacetime Hero” copyright © 1981 by James Sullivan. “She Lives Downstairs” and “Dumb Models” copyright © 2011 by Douglas Hubley, Michael Piscopo, Kenneth Reynolds and James Sullivan. “Keep on Smiling” copyright © 2010 by Douglas L. Hubley. All rights reserved.